Admittedly I only began reading The Help after all the hype about the film and Octavia Spencer’s Oscar-winning performance as Minnie, the fiercely outspoken maid who commits A Terrible Awful Thing against one of her employers. And despite my misgivings that the novel would not measure up to the hype surrounding the film (incidentally I read the book before watching the movie! ), I found myself really enjoying this novel. It’s pace is slow and genteel like a long hot summer, but with a undercurrent of malevolence which serves to highlight the growing tension during the emergence of the Civil Rights Movement in 1960s Mississippi. But it is also a very personal novel. It is at once a love letter to Mississippi whilst acknowledging her faults and wrongs but at the same elevating the common thread that binds blacks and whites together, their humanity, love and relationships. The story centres around three main characters Aibileen, a black maid raising Mae Mobley, the eldest daughter of her white employers, the Leefolts, after the tragic death of her own son. Though a quiet and gentle woman, Aibileen is embittered by the death of her son and no longer so accepting of the unfairness of life in Jackson, Mississippi. Minny, her best friend is considered the best cook in Jackson, but her feisty ways and sassy tongue often gets her into much trouble with her employers. A run-in with the influential Hilly Holbrook, in which the Terrible Awful Thing is committed causes her to be unable to gain work elsewhere until she fortunately able to find work as a maid to Celia Foote who is more or less a social outcast to the rest of the white women of Jackson due to Hilly’s machinations. Lastly there is Skeeter, a young white woman, best friends (inexplicably) with Hilly Holbrook and has ambitions to be a writer, and comes home from college to discover that her beloved maid, Constantine has left the family but nobody will tell her the real reason why. Improbable as it may seem, these three women form a tight bond of friendship which begins with Skeeter’s desire to write about the relationship between black maids and their employers (from the maid’s point of view) and her quest to find out what really happened to Constantine. However, Skeeter’s project is not without its difficulties, as to find maids willing to openly discuss their working relationship presents a problem because in a town as small as Jackson, even with guaranteed anonymity it would not be hard to discover who is being talked about and would put the maids at risk of losing their jobs or worse. But a series of events slowly convince Jackson’s maids to take part in the project, encouraged by Aibileen and Minny who from the start see both the benefit as well as the danger in talking to Skeeter about their experiences. Kathryn Stockett doesn’t shy away from the complexity of what Skeeter is attempting and skilfully contrasts Skeeter’s naivety against the cautious wisdom of Aibileen. As the novel progresses, and that of Skeeter’s interviews with the maids, what begins as a project to get Skeeter published becomes a desire to highlight not only the injustices but also the kindness, the joy, love and friendship experienced by the maids in certain circumstances. Skeeter begins to question her own upbringing and the life she has taken for granted, as well as the people, and begins to understand truly who her friends are. It’s not about being white and therefore having the upper hand in all things or about being black and subservient to others. It’s about who you are and your willingness and courage to stand for what is right no matter the cost to you personally. 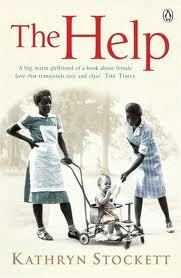 The Help, noble a story as it is does present a bit of a problem, one that the author shares in her end notes. It is that of voice and I guess ownership of stories. Here you have a white woman writing a novel about a white woman writing about the experiences of black women in their words and in their voice. But I guess the main argument here would be that in the 60s, for black people to speak out against the daily injustices they faced meant death especially in Jackson. The lives of the Civil Rights leaders of that era were constantly under threat and in some instances where those who opposed them were successful in silencing their voices, it served as a warning to others not to follow. But it also served as a touch-paper to light the fire to cause others to rise up, which is what I think happens here in the novel. I also think that rather than focus on who is telling the story, we should instead think about whose story is being told why it is important to hear. Posted on 26 May 2012 15 March 2018 by queenpea77Posted in ReviewsTagged fiction, film, just-read, reviews. Liked your review. But ‘whose story’ to me is not as important as to who is telling the story. Glad you liked the review. I know what you mean, I think – If I’ve misunderstood, please forgive me! I wrote what I did because I was thinking that the author was writing of her own personal experience through the character of Skeeter and wanted to tell the story about a person whom she loved dearly in their words, as they wouldn’t have done. But the question of ‘whose’ and ‘who is’ will always be problematic though resolution may lie in context and/or motive. Yeah sorry I didn’t expand. Catherine Johnston wrote an article last year in The Guardian, of how there are suddenly books written about black people, written by white people. She believed the reason for this is because white readershiop perhaps needed black stories to be ‘filtered’ for them to be acceptible reads. Of course The Help falls into this category. Although the author says she is writing her own story and always wondered what happened to the real life nanny she had, nonetheless it is still ‘someone’ else’s story. The Help was an interesting read but I guess the most annoying part for me was that Stockett got away with creating a black character who was open with her hostility towards the white community. I say this because I have been told by publishers – whatever you do, do not create a black character who will harm in anyway a white character! So we cannot do this but white authors can. I guess for me who is telling the story is more important than whose. I hear you but I feel that your point is more to do with the prejudice of the publishing industry than it is to the author. Black authors have been writing similar stories for years but rarely get the hyped up press or the kudos of a Hollywood movie and ensuing Academy award. And yes it is frustrating to see that it has taken a white author to bring to light stories that for many black and I would say white reading audiences is nothing new. I’d like to give Stockett the benefit of doubt, that she was merely trying to tell her story and that of her nanny’s. However, I do recognise that however innocent her motive it merely highlights the issue in the novel through the character of Skeeter, who effectively does the same as Stockett and the ‘other’ white authors Catherine Johnston alludes to, in filtering black stories for white audiences. Hence my point about purpose and context being just as important a question to ask. Also, if we take the argument about white author’s writing black people further, would that mean that a black author could not write about mainly white characters? Would publishers find such a novel unmarketable? Because I think that’s really where it comes down to in this case – what the publishing industry believes to be marketable. And while there is a lack of cultural diversity within the publishing sector, certainly in the UK, this is something is something that is sadly likely to continue. There’s more I could say about this and I thank you for bringing it up because I think it is a subject for a lengthier post / debate. Thanks for that – I know, one could just go on and on but your point about whether a black author could write about a book which just featured white characters, it is difficult to say. In The Falling Snow by Caryl Phillips, its main protag is black but white and mixed race characters also play a prominent role and of course, it makes it an ‘England’ that I can relate to. One of the reasons why I just love S/African white literature is that the black characters engage with white characters, especially in Nadine Gordimer’s novels – whether as lovers or bitter enemies, it works. As she once said ‘my books speak the truth’, so you can’t help but feel that you are in safe hands when you read her books. She says everything that needs to be said and it is totally honest. With British/English novels, I might be wrong but I just feel there is a long way to go. I read Pigeon English by Stephen Kelman (which I struggled with) and I’m currently reading Christie Watson’s novel Tiny Birds Faraway (which is looking not to be my cup of tea). I know my response is confusing and touch contradictory but I guess I’m particular about how certain stories are told. No I completely understand, and I think your response highlights the problematic relationship we have with the way ‘black’/ ‘white’ stories are told. Perhaps the very fact that they have to be categorised as such, is part of the problem. I am forever ranting about the very idea of the ‘Black Interest’ shelf in bookshops (a half-written sitting in my drafts!). I don’t what the answer is, there may not be one as yet and I think the issue is complex enough to invite contradictions on where you might stand. It’s probably safer to decide on a novel by novel basis. I’ve not read Pigeon English yet, but I did read your post on it and thought you raised really good points though I think I should read the book myself first before agreeing wholeheartedly. Also, I think it’s fine to be particular about how certain stories are told – I am too – especially when they relate to my background and heritage, because let’s be honest you want that which relates to you to be portrayed fairly and truthfully and preferably by a reliable author. Always a pleasure chatting with you!